Prevents bone loss and osteoporosis. Prevents gastric and colorectal cancers. Reduces cramps, irritability, and PMS. 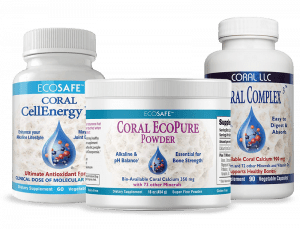 Coral calcium health benefits range from correcting calcium deficiencies and strengthening tooth enamel to preventing against bone loss and osteoporosis. Other clinical studies suggest that coral calcium prevents against various bone cancers, as well as aspects of heart disease. Coral calcium may also help with other chronic health problems, like lowering blood pressure and treating diseases like sclerosis. 74 vitamins and trace minerals contribute to the benefits of coral calcium. Coral calcium comes in an orally ingested calcium pill. Because this form of calcium is easily digestible, your body absorbs the additional vitamins and minerals at a higher rate than traditional calcium supplements. This leads to even greater coral calcium benefits. Learn: Which Coral Product is Right for You? The best coral calcium minerals come from above sea naturally fossilized coral beds. Where does coral calcium come from? The best coral calcium comes from above sea naturally fossilized coral beds. Over time, natural geological events push up these fossilize coral beds. This then makes it possible to mine coral calcium. Coral calcium is similar to calcium carbonate found in rocks. The difference is that the calcium in coral calcium comes from coral animal structures. These are tiny sea anemones (coral polyps) that take in minerals from the ocean and create coral deposits on the ocean floors. We take care in sourcing the best coral calcium. Some coral supplement suppliers harvest coral below sea levels around Pacific beaches like those surrounding the Japanese island of Okinawa. This harvesting often upsets the ecological balance and destroys living coral reefs. We harvest our coral calcium in the Caribbean and make sure that our Coral Complex is certified 100% ecologically safe by Friend of the Sea, a non-profit, non-governmental organization. All of this comes as part of our commitment to the environment and coral reefs around the world. Powdered forms of coral calcium are critical to the fast absorption of key trace vitamins and minerals. The all natural animals structures found in coral calcium powder benefits you because your body absorbs it more easily than traditional calcium supplements. In an actual coral calcium supplement tablet, you can find over 70 minerals including calcium, magnesium and calcium citrate. Coral calcium health benefits span multiple generations. The benefits of coral calcium can span multiple generations. If you think that only children and women over 50 need calcium, think again. The National Osteoporosis Foundation estimates that the average adult in the U.S. gets only 500 to 700 mg per day. The FDA suggests adults 50 and younger need 1,000 mg a day, and those over 50 need 1,200 mg. The calcium benefits of Coral Calcium apply to men too. This isn’t a product just for women with osteoporosis. Men are just as calcium deficient according to scientific findings. Calcium also plays a vital role in muscle contractions – even in the heart. In addition to creating strong bones and teeth, calcium also plays a vital role in muscle contractions – even in the heart. Several studies suggest that low dietary intake of calcium can lead to an increased risk of developing hypertension and cardiovascular disease. In a Taiwanese study of coral calcium health benefits, calcium was even shown to have a protective effect against both gastric and colorectal cancers. Calcium may help women with PMS suffering from cramps and irritability. Studies show coral calcium benefits metabolism. Calcium may also affect metabolism. According to a recent University of Tennessee study using mice, calcium appears to control how fat cells work. Mice receiving the most calcium produced 51 percent less fat and broke down fat tissue three to five times faster. This leads to them gaining 40 percent less weight than their calcium deficient counterparts. Coral calcium benefits bone health. Now that’s a lot of health benefits! But let’s focus on calcium and bone health. This is where calcium makes its most profound impact. Our bodies’ constant remodeling processes re-absorb and replace about 20 percent of our bone every year. When dietary intake is inadequate, calcium is removed from our bones to make up for the loss in our bloodstream. This calcium deficiency then leads to osteoporosis. This literally translates to “porous bones.” This condition can become severe and lead to bones that break under the weight of the body. There are often a few clues that you may have this condition. Symptoms are often absent until fractures occur. Calcium intake during early adulthood ensures bone density. Getting enough calcium in early adulthood is vital to ensuring that bones reach their maximum density. As we age our bodies become less efficient at absorbing calcium. The good news is that it’s never too late to start taking coral calcium supplements. Slowing bone loss and raising bone density starts with proper coral calcium supplements. Coral calcium is a rich source of calcium – especially for those over 50. Calcium is the most abundant mineral in the human body. It also has some of the most intricate interactions with nearly every other mineral on Earth. You may be able to source calcium from certain foods. However, unsustainable farming practices have lead to mineral content in U.S. soils. This now means that there is substantially less natural mineral content left in our food. Easy absorption means more nutrients for your body. Because coral calcium contains a more broken down form of calcium, it’s easier to absorb than other calcium supplements. This is important for those over 50 who are less able to absorb nutrients. Coral calcium’s digestibility also makes it unique. Your body more readily accepts coral calcium because of its easily absorbable ionic form. Coral Complex’s superior assimilation properties make it one of the best coral powder calcium supplements on the market. The final key to receiving the maximum bone health benefits from calcium is in finding a quality supplement. You’ll also want to consult with your physician and seek proper medical advice before taking any dietary supplements. How can I start reaping coral calcium health benefits? Coral calcium is available on Amazon and in health food stores nationwide. Feel free to connect with us if you have any further questions or use our handy store locator to find coral calcium near you. Which coral product is right for you?